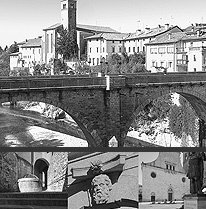 A history through the centuries, this is the tradition of Piasentina Stone: elegance and nobility have made it the quintessential element of Friulian architecture, as is testified by the name itself. Indeed, according to ancient beliefs, the Piasentina Stone draws its name from the appreciation that it has always enjoyed by Friulian customers, who claimed it was a stone that "piase", i.e. a stone they “like”, according to the dialect of Udine. Excavated and extracted from an exclusive confined Pre-alpine area of Eastern Friuli, the Piasentina Stone was known and appreciated since Roman times, and was used to decorate and embellish many works and monuments, especially during the 16th century, when it was admired and used also by the famous architect Andrea Palladio. The Piasentina Stone achieves approval and consent even today. Its elegance and versatility make it ideal for any valuable project: from home interiors of a luxury home to more ambitious public and commercial works.